The newly constructed clinic is located in the Cape Horn Square Shopping Center at the northwest corner of Cape Horn and Lom﻿bard Roads. 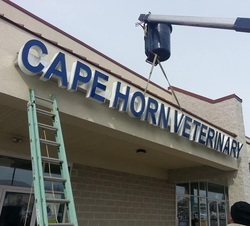 We are located on the west end towards Cape Horn Restaurant. We offer plenty of off-road parking in our spacious center parking lot. We have 4 comfortable exam rooms, a large pharmacy, treatment room, laboratory, centralized ICU, independent dental surgery suite and large general surgery suite, a digital radiology suite, a comfy quiet cat room and a spacious dog room with generous runs. We also have a covered and fenced-in exercise area in the back.